Content previously on this web site is still available on request. Probably. Welcome ! Here I am as a teacher. Hi- I’m Rick Rayfield. I taught from 1997 to 2012 at St Joseph College, usually commuting one day a week from Vermont to West Hartford CT, and daily on-line. It was a great experience- interesting students, eager colleagues, and a can-do atmosphere. Previously I taught in Vermont at Norwich College/Vermont College, and Trinity College. From 1979 to 1986 I taught and did research at Roosevelt University in Chicago, where I was granted tenure. I resigned and moved to Vermont to raise my family near grandparents and to take over my family’s book shop. I have taught Boy Scouts, and Red Cross swimming and skiing in the local schools and rec programs, and I am a long-time volunteer teaching nature and ecology in the local elementary school. With a reduced teaching load at present, I am finally writing up a series of laboratory studies for journal publication, a sort of sabbatical. and Israel Goldiamond, my doctoral adviser, known as an operant purist, with applications ranging from stuttering to bulimia and a crusader in favor of constructional rather than pathological approaches to treating behavior problems. I built an animal lab in Goldiamond’s clinic, tying together basic research with the assessment of human intervention. As a Goldiamond student, I was present and active at the founding of the Association for Behavior Analysis, originally MABA, now ABAI. In his clinic I was involved in the treatment of stuttering, drug addiction, eating disorders, and a range of psychiatric presentations which were thrown to the “behaviorists”. I studied for a SAR certificate at the Institute for the Advanced Study of Human Sexuality in order to teach human sexuality. Wardell Pomeroy (second author of both Kinsey studies) was the Dean and one of our teachers . When I left Roosevelt University, my sections of human sexuality accounted for about one quarter of the psychology department’s total enrollment. I took art history and studio courses while a faculty member at Roosevelt University, and studied painting conservation and frame construction with the Assistant Conservator Barry Bauman at the Art Institute of Chicago. These have informed my Psychology of Art course and my History and Systems of Psychology course, among other applications. I have done research in the visual system plasticity and taste preferences in cats, treatment with stutterers and heroin addicts, and operated pigeon and rat labs. The pigeons were demonstrating that signal detection theory applies to time perception, showing that errors of judgment are indeed rational decisions. My rat work looks at how schedules of reinforcement produce profound effects on bowel motility, a likely analog of human irritable bowel syndrome. I can produce and control diarrhea by robust behavioral mechanisms that are untouched by drugs or diet, in seeming paradoxical ways. My experiences also include consulting with Matt Israel to develop acceptable methods to punish self-injurious behavior of institutionalized autistic children. Then for over a decade in Vermont I consulted and then developed a replacement for complete control and data acquisition for human operant research at the University of Vermont Human Behavioral Pharmacology Laboratory. I developed computerized systems used world-wide for measuring maximum oxygen uptake ( VO2 max) in the early days of personal computers (1974-1990). These were used in research, athletic evaluation, notably in US training camps for the 1984 Summer Olympics in Los Angeles, and cardiac rehabilitation. I worked with Joan Darbee at the University of Kentucky integrating breathing valves and gas handling with a mass spectrometer and writing computer software for evaluating different therapies to alleviate COPD and asthma. For 15 years (1997 to 2012), I taught psychology at St Joseph College (now University of St Joseph)- Intro, Personality, History and Systems of Psychology, Human Development, Human Sexuality, Psychology of Fear, Psychology of Art, and Behavior Analysis. I was the program director for the Liberal Studies progam at St Joseph from 2007 to 2012. It was licensed as an on-line interdisiplinary degree program but never had enough in-house on-line courses to fly that way. The Dean who hired me bailed out when the College decided not to reapply for licensure due to a lack of sufficient on-line courses. Because of student need and my background in interdisciplinary study, I stayed on so that students who lost their major could exit with a degree. For about twenty years, I have been a parent volunteer teaching nature and ecology in the Fayston Elementary School. The Four Winds Nature Institute trains the parents and other comunity volunteers, and then the parents come into the classroom, coordinating with the teachers. The five year rotating curriculum is keyed to Vermont science standards, but is notable for getting the students out into the woods for observations of the classroom material. Fayston School ranked #1 in all Vermont in reading and math standard tests in 2013, and recently ranked fifth in all New England in standardized science testing. My other work includes owning a book shop with video rental. This dovetails nicely with teaching liberal studies, including using of film as a teaching tool for interdisciplinary work. I have been building my house since 1988, learning and doing the concrete, carpentry, electrical, plumbing, gas, roofing, tile, painting and flooring myself. I sing in my church choir, and with my wife in the local community chorus, and as a frequent member of the chorus in the Green Mountain Opera Festival. Since 2002, I have been the songleader for Phi Gamma Delta at the University of Chicago’s Interfraternity Sing (IFSing.org). I am active in my local masonic lodge and as drama director for the Central Vermont Valley of Scottish Rite where I am a 33rd degree member. I am an Eagle Scout and served as a Scoutmaster to an inner city Scout Troop for 13 years. I served as Cubmaster for Cub Scout Pack 798, and as Scoutmaster for Troop 700. I bake bread twice a week for my family and the local food shelf, as well as for other nonprofit events. I try to maintain the simple web sites I built for my masonic lodge, my Cub Pack, the Interfraternity Sing, my grandfather’s fishing club, our community chorus, the local food shelf, and my book shop (see below). 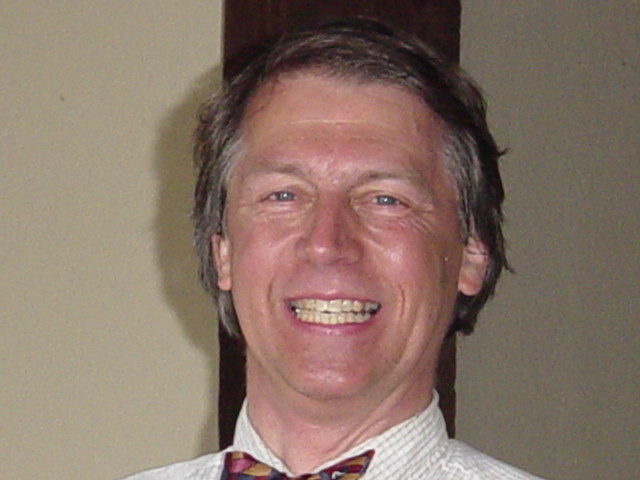 I perform weddings and civil unions as an elected Justice of the Peace (or as a minister), serve on the local Board of Civil Authority, serve as Democtratic Town Chair, and have been elected twice as Town Moderator..
My wife Holliday is a psychiatrist; I have four daughters born from 1985 to 2004. So far, they have attended Wellesley College, Principia College, and Barnard College. This web site was started to communicate to students, friends, and family about my recovery from a stroke in 2005 (see tab). Now I use it to stash all sorts of information (as you can see) where people (like me) can have easy access to it.